Endurance Nation has a long history on the Ironman® Lake Placid course: Coach Patrick has raced the event seven times, qualifying for Hawaii three of those occasions. Patrick’s personal best is a 9:54; he has held a training camp on the course every year since 2002, and he’s attended almost every edition of the race. Finally TeamEN has historically had between 25 and 75 athletes at the race every year since 2008. We’d like to share that experience with you with these consolidated tips and resources specific to the Lake Placid course. In our opinion, Lake Placid has the most consistently unique weather of any US Ironman® course — being nestled in the mountains with a full 50% of the course at a different elevation can mean multiple weather systems in the same day. In short, you need to be prepared to race in any conditions. That said, don’t sweat the weather report until about Friday of race week. Again, we’ve seen the weather change dramatically in the last fews days before the race and the forecast for Sunday won’t be accurate until Saturday morning. Likewise, if you see a forecast for rain, it could only be a passing shower that unleashes some humidity…but it could be a torrential downpour…only race day will tell! The timing of an event should the #1 criteria you use for selecting what Ironman to train for and race — not hills, not weather, not water temperature, but does rather the timing of the event work for you. Will you have cooperative weather and hours of daylight available for training, especially in the last 8-10wks of your work up? Do not underestimate the challenges of long, long rides on the trainer necessitated by choosing a sub-optimal combination of race date and your typical weather conditions in your final workup. Northeast: Timing is…just right. This is really the earliest you can race and be 100% ready, plus it’s a hometown race for most triathletes in the region. Southwest and West: No issues with hours of daylight, weather, and the ability to train outdoors. More than anything else, the sheer distance of the race makes it rank a bit lower. Travel costs and logistics: Placid is about a 5-hour drive from almost anywhere. No joke! So even a flight will only put you into a rental car that you need to drive for a few more hours. Lodging: ALL hotels in the area are booked (Placid is small) and rates are jacked up. You might be able to book a more affordable hotel in Saranac Lake and drive 30′ each way to the race. Parking: Rather than drive around and around trying to find a spot on the street, just park at the city lot downtown. The parking rates are very affordable relative to big city rates. Dining: Lots of options to suit just about anyone, especially the beer afficianados. Be sure to visit the Placid Pub for a taste of the local brew scene! Now, let’s get on with the race! Practice Swims: The course has buoys out there all week (most of the year, in fact) but it won’t be fully setup until sometime Friday. You’ll be able to swim in the lake before race day, just don’t over do it — those permanent buoys are actually longer than the race course! We recommend you swim an abbreviated loop, picking up landmarks for navigation on the opposite shore. Then bang a right, swim across, another right, and come back looking for more landmarks. It’s more important that you get a feel for the water conditions. The Swim Start: From 1999 to 2013, the Lake Placid swim start had gained a reputation for being one of the most crowded in the sport. With nearly 3000 athletes all jammed into a narrow beach there was a LOT of contact. The permanent underwater cable made life easier, but still it was tough. With the new wave swim start protocol for the 2013 race, things wend much more smoothly for all save for the Pros, who only just finished their first lap right after the final Age Groupers entered the water. There is a “pro lane” to help them maintain their speed. The Course: The Lake Placid swim is a two loop affair in Mirror Lake, from a beach start. You’ll swim directly out from shore about 800m, turn right and swim about 100m, turn right again and swim back towards the pier. You’ll go around it, exit the water, run over a timing mat, then run/swim out to the first buoy, repeat. Lake Place has one of the longer transitions in the sport. It’s basically a long run from the lake, up a street and into an oval concrete skating rink. Your bags are hung outside on racks (T1 on top, T2 on bottom), your bike is racked on shaded grass, and the changing tent is between them. By the time you exit transition at the mount line, you will have covered more than a 1/2 a mile! Same drill when you come back into town and start lap number two, but you’ll be much more tired. 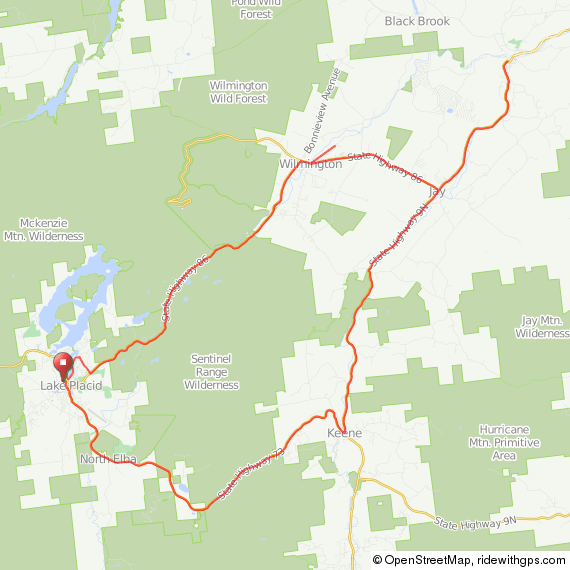 If you reference the bike course profile, you’ll see the descent and the rolling to flat sections of Keene, Upper Jay, Jay and Ausable Forks. The first lap is generally free, but by lap two the wind here is pretty significant and can really slow you down you have over-achieved early on. After your “free” early miles you’ll turn right on Hwy 86 and effectively cross over to Wilmington before you start the true climb back into town. Right away you are slapped with a real solid climb — aka “Foundation Hill.” After a way-too-short descent you have two more short and steep climbs that will test your patience. This is the section of the course that no one talks about — it’s lost in the elevation profile and it under-appreciated until the second lap where everyone who biked too hard too early are now wondering how they will ever make it back into town. This early part of the climb is truly the worst, and is “only” four miles long. Then you have a respite past the High Falls Gorge, some rollers along the stone wall and then more speed with slight rollers though Mile 51. 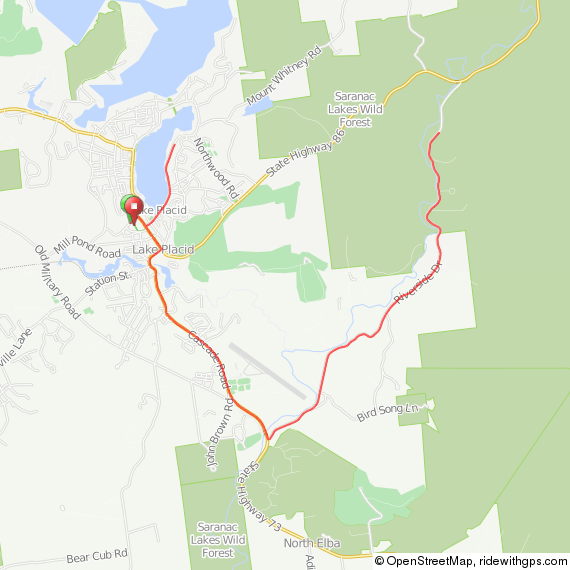 Then you begin the second half of the climb, working your way up to the top of “Poppa Bear Hill” and heading into town. The run course hasn’t changed in…well…forever. It’s a fair course with adequate ups, downs and flats such that most people can still run well if they aren’t nuked. Townie Hill; approximately 1 mile long that takes you from Lisa G’s up to the Placid Brew Pub — this is the worst hill on the entire day. Awesome! You’ll stay right to head to the finish, then enter the Olympic Oval and begin the half lap jog around towards the stands and the finish line. Enjoy and don’t forget to live it up in the chute! We’ve found race reports to be extremely effective tools to teach our athletes how to race: TeamEN post their race reports, as well as their race and race rehearsal plans, in our forums for peer review from their comrades. The result is a very rich, team-wide knowledge base of race execution tips and a culture of athletes helping athletes learn now to race better. Racing Ironman? Attend Our FREE, LIVE Four Keys Talks!